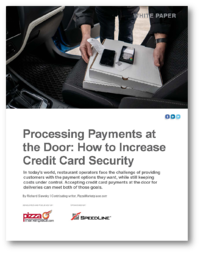 Recently, Pizza Marketplace released a new whitepaper about improving credit card security using technologies that allow customers to pay at the door. Consumers throughout the United States are increasingly using credit cards to pay for deliveries, and keeping that payment secure is important to protect your restaurant from fraud. “According to your credit card processor, card numbers taken online, over the phone, and handwritten upon delivery are all high risk. Prior to 2015, when EMV standards were implemented, it was the card processor that would eat the cost of fraudulent credit card transactions. Today, if merchants are not using EMV, they are the ones holding the risk.